Jeff Pockat Our banners, silk and other fabrics, are an expression of our worship. The Lord reveals them to us in creative inspiration. Some are solid colored flags, and He tells us the meaning of each color. Others are dyed and/or painted symbols on silk representing attributes of the Lord, visuals of biblical descriptions, or elements used at His command to further His purposes. With them we praise and honor our glorious Lord, do spiritual warfare, celebrate His goodness, rejoice in His work and the wonder of Who He is! Yahweh Nissi: The Lord is our Banner! 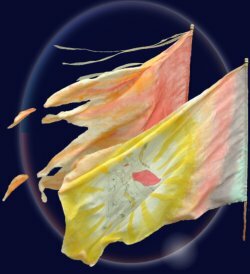 Hand dyed/painted silk worship banners (also called praise flags) dimensions are approximately 31" X 43" on a 36" hardwood rod. Fabric is 100% Habotai (China silk). Because these are art banners, no two are ever exactly alike. More designs coming. Click here to view selection and ordering information. Peg's Banner Catalog PDF file. Instructional sheet for silk banners is available. Click here. Web design copyright 2003-2008 by M.L. Arnoldussen. All rights reserved.